Around a month ago The Witcher 3: Wild Hunt got it's second and last DLC for the main game. CD Projekt Red, the developers of this game, called Blood and Wine an Expansion instead of a DLC. I definitely think this is accurate. The previous expansion, Hearts of Stone, was more like a DLC that leaned towards an expansion. Hearts of Stone, opened a new section of the map in Novigrad and gave you new missions, and places to mark off on your map. In comparison to the new expansion, Blood and Wine, what Hearts of Stone gives is much smaller. I love the newest expansion to the Witcher universe and it's plot with strong female lead and returning characters from earlier games. With this expansion we got an entire new area to explore. A whole new map of the area of Toussaint. In this area there are a bunch of smaller towns that Geralt, the main character, can go and get plenty of missions. I loved the fact that the developers made the side missions you do important to the story line of Blood and Wine. If you've never played the Witcher, it is an action adventure role playing game. Unlike games like Zelda and other hack and slash games this game requires a certain amount of skill. When put on it's hardest difficulty you could die by taking just one hit no matter what gear you're wearing. The main character of this series is Geralt, who is what this world calls a Witcher. Witchers are men and (rarely) women who go though trials, ruthless mental and physical conditioning, and rituals such as alchemical experiments, and magical training. All of this conditioning leads to results of having cat like eyes, resistance to disease, a fast metabolism, increase strength, speed, reflexes, endurance, magical powers in the forms of signs, accelerated healing, and an incredibly long lifespan almost to the point where immortality is a possibility. Witchers take on contracts and jobs to kill and hunt monsters that are terrorizing and killing innocent humans. Geralt unlike most Witchers is a more merciful Witcher due to his morals of trying to help monsters resolve their curses before deciding to kill them. Geralt can be played so that he finds out all of the information on a job and a situation before deciding what side to be on. Blood and Wine is about exactly what the title says. 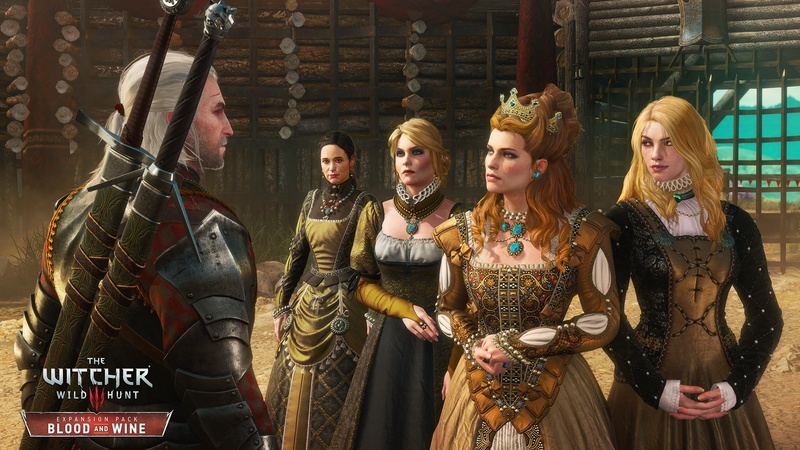 In a land full of vineyards and more wine than you can find water, Geralt is summoned to Toussaint on a contract to kill "The Beast" that has been killing nobles and knights. It offers plenty for the players to do. All of these additions are the things that I love doing in this game. One of my all time favorite things to do in the Witcher is play Gwent. In this expansion, a new Gwent deck was added. This gives me plenty to do because I am running around challenging anyone and everyone just to get cards from them to build my new deck. Honestly it took me a good 2 days of playing to actually get almost all of the cards and compete in the competitions that the game offers of the new Skellige deck. Another one of my all time favorite things to do is to go gear hunting. In the new expansion there are a total of 100 new individual armor pieces and 30 new weapons. Now I'm not a big fan of all the regular armor sets, instead I prefer the Witcher gear, so I was very pleased when I found out that after some searching for the schematics, I can turn my Mastercrafted Cat School Gear into the Grandmaster Crafted Cat School Gear. One of my favorite things about this expansion is the fact that you can own a vineyard. I'm always a fan for owning property in a game. I love the managing and maintaining a home in games,and being able to spend my in game money on something besides repairing my gear. The home that Geralt can get, when fully upgraded gives the player a lot of buffs when you use the bed in the home. Now that I've played both expansions and the game I am thoroughly convinced I want to finish the first and second installment of the series and read the book that the games were inspired from. If you haven't played the Witcher I highly recommend you do. This is still one of my favorite games to date. This game took me at least 3 months to beat and offers a lot of different challenges to the player. The game itself is difficult but this just makes it more fun to play. There is so much to do that you could spend days working on one area to finish all of it's missions, contracts, scavenger hunts, and viewing every single question mark on the map. As the game goes on he maps just get larger and larger. The Witcher 3 puts Skyrim to shame with it's massive maps and dialogues. With such a large game you are going to get glitches here and there. In my opinion these glitches just make the game even better because they are pretty crazy sometimes. My advice is to save often because theirs always a monster lurking around close. The story line of the main game is just heart wrenching and amazing. Of course the expansions are just great additions to this game because both have very detailed and in depth plots. They are simple by no means and sometimes offer you choices you never want to make. These plots will also pull at your heart strings a bit because they are so real and emotional. Besides the story, as you've seen from above, they are almost entirely new areas that offer you plenty to do including a whole spectrum of new quests, jobs, contracts, scavenger hunts, and a whole array of new question marks to be found. This game is said to take you around 300+ hours to beat and I can definitely testify that I spent a good 3 or 4 months playing casually trying to beat this game and I still have the entire map of Skellige left to complete.